Google has ported seven new Android apps over to Chrome OS, expanding their reach beyond phones and tablets without altering the apps much at all. The search company highlighted three of the new additions for the holidays in a Google+ post: Cookpad Recipes, Couchsurfing and OverDrive. These apps and four others join Evernote, Duolingo, Vine, Sight Words, and more in the Chrome OS web store's Android apps section. However this section also contains web apps, making it not the easiest list to parse through - leaving us clueless as to what the other four new apps are. Google launched Chrome OS to be a lightweight cloud-run laptop operating system, but a lack of quality apps has forced it to look toward Android. 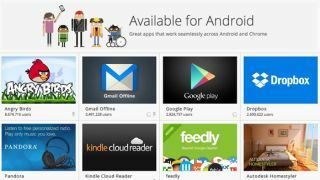 The first of what Google promised will be many Chrome OS-compatible Android apps arrived in September. Android's app ecosystem is booming, of course, though Google's rollout of Chrome OS-compatible Android apps is so slow you wouldn't know it.